Mini shou Pu-erh cakes are a great way to explore this vast topic without breaking the bank. This Phoenix tea cake was pressed in 2009 by the Xinghai Tea Factory from leaf materials gathered in Menghai County, Xishuangbanna Prefecture. It is the highest grade mini shou cake manufactured by that tea factory in 2009. It is made from gong ting (smallest and highest grade leaf ) and 1st grade leaf, and has been given a high degree of fermentation. 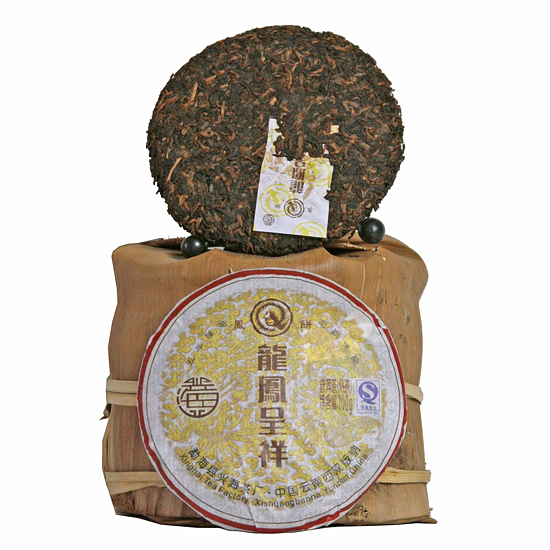 This tea cake has a rich, brothy, forthright flavor as well as an underlying smoothness and softness. It is a classy example of shou Pu-erh with a clean and fresh (not fusty or musty) wo dui aroma. Overall, this tea is pleasingly full and round in the mouth, and is ready to drink now or will continue to age for many more years. Unlike many shou Pu-erh which are very hard and tightly compressed, this cake has been given light/medium compression which means it will easily break-up by hand or with a Pu-erh knife. To open the cake: gently bend back and forth by hand to loosed the interlocking tea leaves and break the cake into pieces or use a Pu-erh cake breaking tool to separate the leaf.